WHITE SLAVERY IN SONOMA COUNTY? And so it came to pass: After 30-odd years, Santa Rosa's infamous tenderloin district was closed. Kinda, sort of. Maybe. The April, 1909 eviction notice from the District Attorney was years overdue in the eyes of many citizens, yet there were probably more than a few skeptics that doubted the town would actually close the whorehouses. After all, similar promises were made the previous year after the prostitution ordinance was repealed, and the year before that when Superior Court Judge Seawell ruled that the ordinance was illegal to begin with. But this time, Santa Rosa meant it: In 90 days, the red light district would be no more. Santa Rosa delayed taking action until the last possible moment in hopes that a higher court would overrule the decision in the case of Lou Farmer vs. Dan Behmer. Truth was, the Old Guard clique that ran the town wanted to keep the red light district around at all costs, and if the tenderloin had to close, there was even talk about building a prostitution mall in the Italian neighborhood, perhaps something along the lines of Storyville. Prostitution brought outside money into town, and fines for illegal liquor sales boosted the city treasury. Some of Santa Rosa's most prominent men also profited directly through ownership of the properties, leasing the houses under the pretense that they had no responsibility - or even any awareness - of how their tenants were using them. The upheld Farmer decision said this was "fraud and a subterfuge;" Mr. Behmer, who also owned a gun shop downtown, indisputably knew what was going on at 720 First street, as he personally collected the rent every month, and had even custom built the house to abet prostitution. Long story short: Santa Rosa's red light district was finally closing only because the court ruled that brothel property owners - rich white men - could be prosecuted. District Attorney Lea sent the brothels "get out" notices in April, after the state Supreme Court upheld the Appellate decision on the Farmer-Behmer case. As the July 1 deadline approached, Lea filed a warrant against an unnamed property owner for leasing a house to a madam, followed by another complaint a few days later against the same landlord over a different house. It looked as if Santa Rosa was actually serious about cleaning up its act. "Complaints will be sworn out against other property owners and they will be compelled to come into court," the Press Democrat reported. "Following their removal from First and D streets the women will not be allowed to locate in uptown apartment houses, Chief Rushmore says." The prostitutes were not taking this lying down (sorry). "The women all agreed to go on the date set," the Republican explained, "but recently they have been fortifying their position to remain in their present locations. They have been signing up contracts for the purchase of the properties they are occupying. They hope to defeat the recent rulings of the Appellate and Supreme Courts that the premises could not be leased or rented for purposes of prostitution, by claiming to own the premises." A few weeks after the eviction date passed, just such a case came to trial. Pearl Webber and Eva Lowell were arrested and charged with "maintaining and living in immoral resorts" at 5 D street. It came out at trial that Eva's mother, Abbie Lowell, had signed a lease-to-purchase contract for the house with Fred J. Bertolani, who testified for the prosecution. He was the son-in-law of Con Shea, one of the wealthiest men in Santa Rosa, and apparently acted as Shea's property manager (a few months earlier, he was complaining about city water hookups in the many Shea buildings downtown). Bertolani told the court that there was an understanding with the Lowell women that the house couldn't be used as a brothel, but he didn't get it in writing, darn it. After 6 hours of deliberation, the Lowell jury couldn't decide on a verdict. A few weeks later, charges were dropped against Lowell as well as the charges against the landlord with the two properties. And that was that. No prosecution of Con Shea or any property owners as accessories to crime; no dragnet for harlots working elsewhere in town; no one run out of town on a rail. But how much did the situation actually change? There's evidence that Santa Rosa's prostitutes and madams were still around, but considerably more discreet in their trade. In his July 6 state of the town address to City Council, Mayor Gray stated "The denizens of the red light district do not parade the street and the public would hardly know of their existence except for the notoriety given them by a certain publication." That "certain publication" was "The Citizen," the monthly newsletter published by the Santa Rosa Ministerial Union, and which endlessly shamed the town for tolerating its red light district, incurring the dismay and anger from city officials and Press Democrat editor Ernest Finley. In its September issue, The Citizen mentioned, "The convenience of a definite location no longer exists. The scarlet women have, to quite an extent, left our city, and those who do remain are not readily accessible..."
To figure out what really happened, we can compare two primary sources: The 1908 Sanborn map (pre-crackdown) and the 1910 census (post-crackdown). In 1908, the map shows there were nine brothels in Santa Rosa's tenderloin. According to the census two years later, 7 D street was now occupied by a Japanese family. 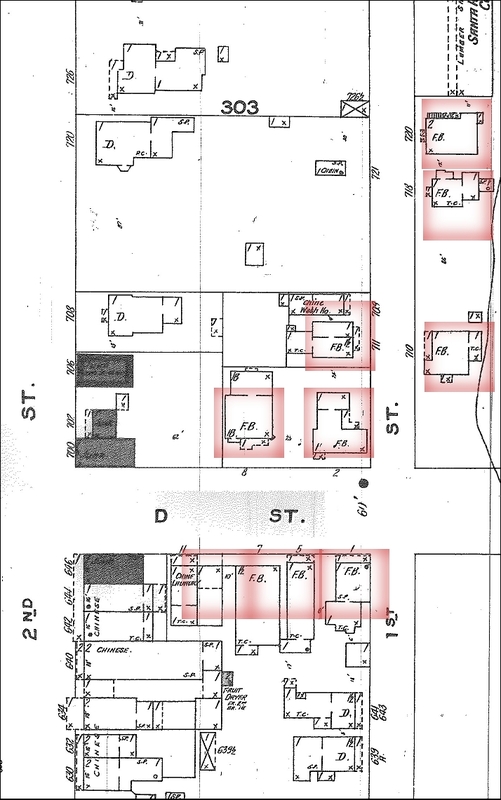 Three other houses - 711, 718, and 720 First street - weren't mentioned in the census at all, so we don't know if they were vacant, torn down, or the census taker didn't bother to knock on the door (number 720 was the address of the infamous brothel owned by Dan Behmer). But Sadie McLean, the madam at the heart of the Farmer-Behmer case, could now be found at number 710 First street and her employment is listed as "own income." Eva Lowell, who went on trial for prostitution a few months before, is at 5 D street, the same building her mother was buying from Con Shea. The census listed mother Abbie Lowell as boarding house keeper, Eva as a music teacher, and a woman named Ruby Smith as a servant. The three remaining houses shown as brothels on the 1908 map fall into question-mark territory. The map lists #1 D street as a brothel, and the city directory for that same year has one Lottie Crocker living there at the time. She's still at the same address in the 1910 census. 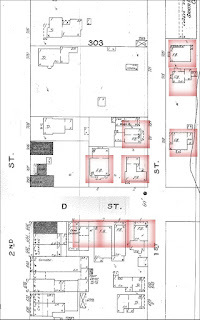 Across the street at 2 D street the census taker found Virginia Watson, a 25-year old proprietor of a rooming house that apparently had only one tenant - Charlotte Crocker, 24, a hair dresser who worked at home. And at 8 D street was Jessie Hobart, 31, the keeper of a rooming house with no tenants at all. Ms. Hobart was one of two women arrested for prostitution in the days immediately after the July deadline. The Ministerial Union newsletter from September also mentioned "It is also said that some of the former denizens of the suppressed district have taken up their abodes in other places in Santa Rosa," which implies that some of the ladies were freelancing. If there was such a scattering, it's likely that there was also a Santa Rosa "blue book" sold under the counter at saloons and cigar stores that advertised where to find their services; these tiny booklets, small enough to discreetly tuck into a vest pocket, were commonly found in both large and small cities in that era. Thus with a few minor tweaks, it was quite possible that the main industry in Santa Rosa's underground economy stayed around. My guess is that at least five of the nine houses in the tenderloin still were operating, albeit no longer waving their red lanterns in the faces of church folk. Maybe they took a lesson from the denizens of the nearby business district: More was necessary than just making the right people happy, financially or otherwise - it was also important to keep up appearances. It wasn't the Wild West anymore, after all. The Supreme Court has handed down an opinion in the case of Lou Farmer against Dan Behmer, denying defendant's petition for a rehearing, and sustaining Judge Seawell and the Appellate Court in their decisions in this case in every particular. Some important questions of law have been finally determined in this case, and the fate of the red light district is settled. Every court has now passed upon the questions involved, and all courts agree that the Legislature cannot authorize by charter, or otherwise, the licensing of prostitution. That the charter is always subject to general laws regulating crime. That a property owner may not injure his neighbor by permitting his premises to be used for prostitution purposes without answering in damages. That he cannot defend himself against injunction or damages by leasing or transferring his property to another. And that it is the policy of our law and government to wipe out these bawdy houses by whatever means are necessary. In September 1897 [sic - it was 1907] Lou Farmer through her attorneys, Judge Crawford and R. L. Thompson brought an action against Dan Behmer for an injunction and damages for leasing and permitting his premises in the red light district of Santa Rosa to be used as a bawdy house to the injury of Miss Farmer's adjoining property. A long hard fight ensued. Every defense knows to the genius of defendant's counsel has been pursued, every available court resorted to, but in each instance he met with crushing defeat. And now the matter is finally settled. Nominal damages only were insisted upon by plaintiff's counsel, but the law is now settled, and in the subsequent cases that will surely follow, every remedy to which the plaintiffs are entitled will be insisted upon. We are assured that the fight against the red light district has just commenced. Unless the owners in that district should take warning from the result should take warning from the result of this litigation and put an immediate stop to such use of their property. District Attorney Clarence F. Lea will today serve notice upon the denizens of what is know as the "redlight district," notifying them that they must vacate the houses at present used for improper purposes. Within ten days they will be expected to let the District Attorney know whether or not they intend to comply with his notice. If they give an assurance that they will, then they are to be given until July 1 to get out. If they refuse to vacate the District Attorney will proceed at once to oust them. District Attorney Lea does not intend to wage any spectacular crusade against the so-called social evil. He hopes to quietly clean up that part of town in which the houses complained of are located. When this has been accomplished, he says, he believe the work should be extended so as to include the removal of the Chinese quarters on Second street. This latter matter, however, is one which must be left to the property owners themselves. Regarding the matter first above mentioned, he intends that as little he said about it as possible, holding that too much publicity has been given such topics in the community already. District Attorney Clarence F. Lea some time since gave the denizens of the tenderloin until July 1st to vamoose from the City of Roses, upon their promise that they would have no further legal proceedings to lengthen their stay in the vicinity of First and D streets. At that time they were informed that if they did not wish to accept the ultimatum to go on the date set, that proceedings would be brought against them at once to terminate their careers in this city. The women all agreed to go on the date set, but recently they have been fortifying their position to remain in their present locations. They have been signing up contracts for the purchase of the properties they are occupying. They hope to defeat the recent rulings of the Appellate and Supreme Courts that the premises could not be leased or rented for purposes of prostitution, by claiming to own the premises. This claim could easily be made under the pretense of purchasing them by contract. District Attorney Lea will not stand for any further interference from these scarlet women and will proceed at once against them. Chief of Police Rushmore is standing with District Attorney Lea in the matter and has ordered that the women shall not be permitted to make their homes in the lodging houses of this city as they once did. He has given orders to his men to arrest every one of the women who secures a location in a lodging house. Late this afternoon District Attorney Lea had a complaint sworn to against one of the prominent property owners of the vicinity. Others will also be filed and this is the opening of the battle to rid that section of the women. District Attorney Clarence Lea stated yesterday afternoon that there be no let up until the redlight district is moved from its present location at First and D streets. This is the last day of grace for the denizens of the district to remain there under the notification he had served on them sometime since. They promised him then that they would move out by July 1, and Mr. Lea says they must do so, despite the fact that word has come to his ears that some of them have made contracts, or say they have, to purchase their houses. Yesterday afternoon District Attorney Lea swore to a complaint against a large property owner in the district, charging him with letting a house for improper purposes. Complaints will be sworn out against other property owners and they will be compelled to come into court. Following their removal from First and D streets the women will not be allowed to locate in uptown apartment houses, Chief Rushmore says. The property owner against whom a warrant was sworn out for renting a house for immoral purposes a few days ago had another warrant of arrest sworn out against him by the district attorney's office on the charge of leasing another house in that district for the same purpose. Attorney T. J. Butts is representing the defendant and filed a demurrer in the case which was overruled by Justice Atchinson. A plea of not guilty was entered. On Saturday Judge Thomas C. Denny made temporary orders for injunctions against Jessie Hobart and Dollie Smith, women of the tenderloin, to prevent them conducting their houses there. District Attorney Clarence F. Lea secured the orders of the court, and when the suit comes to trial will seek to make the injunction permanent. Recently these women were arrested for having returned to their homes in the tenderloin district, after having been ordered to vacate. If they should return now while the temporary injunction is pending they would be guilty of contempt or court and would be prosecuted. District Attorney Lea has announced that he will prevent the women returning to these places and he proposes to make good in this. Officers made a raid on a house on First street at an early hour Sunday morning and arrested two women. One was charged with keeping a house of ill-fame and the other was living in and about the house. They were both locked up in the county jail in default of $1000 bail fixed by Justice Atchinson. A man caught in the house will be used as a witness against the women. He will be punished, too. At the instance of the district attorney's office the case of the people against Pearl Webber and Eva Lowell, charged with maintaining and living in immoral resorts, has been set for Friday morning...The other cases in this regard will be proceeded with as soon as these are out of the way. The first of the prosecutions by the district attorney's office against the women of the Santa Rosa tenderloin was begun in Justice of the Peace A. J. Atchinson's court on Friday morning. It was the case of the people against Eva Lowell and the complaint charged the defendant with maintaining and abiding in an immoral resort on D street. The prosecution was conducted by District Attorney Clarence F. Lea and the defense represented by Attorney Thomas J. Butts. All the seats in the court room had been pre-empted long before the hour set for the trial and standing room seemed to be accepted cheerfully by the less fortunate spectators. Owing to the scarcity of available veniremen out of which to secure jurymen enough to fill up the seven vacancies yet remaining in the jury box, the case of the people versus Eva Lowell was continued by Justice Atchinson until Tuesday morning at 10 o'clock. During the two hours intervening between the time the court adjourned at noon on Friday and its being called to order at 2 o'clock, Constables Boswell and Gilliam, scouring the town, were able to secure two more veniremen only. Either business had suddenly begun to brighten up for these talesmen, [sic] or the lure of nature as she is met with out of town had suddenly commenced to exert a fascination over them. Anyway they were not to be found nor in a position to make an appearance in court. Just one witness was called before the noon recess. He was F. J. Bertolani and took the stand at the instance of the prosecution. He testified to seeing the defendant at No. 5 D street and to the fact that the place bore the reputation up until the first of July of being a house of ill fame. He also stated that he had entered into a contract with Abbie Lowell, the defendant's mother, by which she was to lease the property with the purpose of buying it. That the defendant was present during the transaction he could not state positively. The understanding was, he said, that the house was not under the terms of the new contract to be used for immoral purposes, though this stipulation was not reduced to writing. During the questioning of the witness by the district attorney, counsel for the defense interposed objections at every step. These were overruled and the rulings of the court taken exception to. The first witness called by the prosecution Tuesday afternoon in the Lowell case was G. D. Douglas, the man found in the resort at the time the place was raided over a week ago. He stated that both he and the inmates were in a drunken condition. Special Police Officer Ramsey, one of those participating in the raid, was on the stand a considerable part of the afternoon. He testified to seeing the house in question resorted to by men at different hours of the night during the past six weeks, and had been in the house and heard money pass between the inmates and visitors. After being out for six hours the jury in the case of the People vs. Eva Lowell was discharged without having come to an agreement. About a dozen ballots were taken and the jury stood nine for conviction and three for acquittal. The result was disappointing and unlooked for by people who kept a close run on the progress of the trial, as it was considered a clear case against the defendant. The charge against her was that of keeping and residing in a house of illfame. The cases against one of the owners of D street property charged with leasing houses and lots there for immoral purposes, which were set for last Friday and then continued to be set, were dismissed by Justice Atchinson Tuesday. The action began against two of the resort keepers in the early part of July has also been dropped from the calendar of the justice court.